We had a tremendous time in Arizona for our screening at Arizona State University. Three co-sponsors, the Asian Pacific American Studies Program, the Confucius Institute and the Chinese Language Flagship Program pulled out all the stops for us on our two-day stay in Tempe, Arizona. On Friday, we spoke at two of Professor Jeff Ow’s Intro to Asian Pacific American Studies classes. We went through a presentation that described our lives growing up as Chinese Americans and the forces that shaped us into the artists we are today. Our original goal with Autumn Gem was to introduce the story of Qiu Jin to western audiences. We did not anticipate that this project would also serve as a bridge between our generation and our parents’ generation. Older audience members frequently tell us how much they enjoyed the film and how it reminded them of their own childhood when they first learned about Qiu Jin. They are proud that two members of their children’s generation is bringing this story to a wider audience. Lunch was spent with members from the Asian Student Coalition at this on-campus restaurant which served organic and locally-produced dishes; for dinner, we went to the House of Tricks just outside of the ASU campus, with Mia and Irene from the Chinese Language Flagship Program. It was great comparing with them their experiences growing up in Arizona with ours in California. We shared stories about our travels to Asia and our future desires to learn Chinese. Irene kept stressing that it’s not too late for us to learn Chinese, and as I mentioned in my previous post, it’s on our to-do list! There were many events happening on Saturday in Tempe, Arizona, including the Arizona Dragon Boat Festival and the Tempe Festival of the Arts. In the morning, Rae and I walked to the man-made lake to watch some of the Dragon Boat race heats; I’m glad that I didn’t have to paddle that morning, cause my arms would be so sore — they were paddling so hard it seemed! On the way back to the hotel, we walked through and browsed the various booths at the art festival. We would have stayed longer, but we had a screening to get to! Thanks to the tremendous and tireless organizing by Kathy, Mia, Irene, Jeff and countless others at ASU, we got a great turnout of nearly 100 people for our screening in Room 170 of the Lattie F. Coor building at ASU. Audience members ranged from students in Professor Ow’s classes, members of the Chinese American community, faculty members and even patrons from my parents’ restaurant in San Diego. Many people told us how hot it was in Arizona during the summer; now I understand why many of them came to San Diego during that time of year! Here are photos from our short stay in Arizona. We’d love to come back to screen Autumn Gem some more! Rae and I took the red-eye flight to Reagan Airport in D.C. this morning. We transferred at Atlanta and were fortunate to go on standby for an earlier flight to D.C. We even got upgraded to business class for free! No doubt traveling with minimal luggage and no checked-in luggage facilitated our flight change. Tomorrow, we head to Baltimore for a screening at Red Emma’s Bookstore. Expect an updated in a day or two! 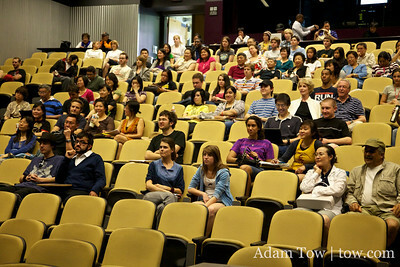 Here are photos from our screening at Arizona State University. You two did a good job.